“Volcano Season” — is it real? The four seasons are caused by the Earth’s axis of rotation tilting towards and away from the sun. But our planet undergoes another, less well-known change, which affects it in a more subtle way. Perhaps even volcanically. Due to factors like the gravitational pull of the sun and moon, the speed at which the Earth rotates constantly changes. Accordingly the length of a day actually varies from year to year. The difference is only in the order of milliseconds. But new research suggests that this seemingly small perturbation could bring about significant changes on our planet – or more accurately, within it. The vast quantities of energy delivered to the subsurface by rotation changes are likely to perturb its stress field. And, since the magma which feeds volcanic eruptions resides in the Earth’s crust, stress variations there may make it easier for the liquid rock to rise to the surface, and thereby increase the rate of volcanic eruptions. The Terra Nova study is far from conclusive. Nevertheless, the idea that minute changes to the Earth’s spin could affect volcanic motions deep within the planet is an intriguing one. But there’s another natural phenomenon which has a much stronger claim to affect volcanic activity – one which might be just as surprising: climate change. In recent decades, it has become apparent that the consequences of planetary ice loss might not end with rising sea levels. Evidence has been building that in the past, periods of severe loss of glaciers were followed by a significant spike in volcanic activity. Around 19,000 years ago, glaciation was at a peak. Much of Europe and North America was under ice. Then the climate warmed, and the glaciers began to recede. The effect on the planet was generally quite favourable for humankind. But, since the mid-1970s, a number of studies have suggested that, as the ice vanished, volcanic eruptions became much more frequent. A 2009 study, for example, concluded that between 12,000 and 7,000 years ago, the global level of volcanic activity rose by up to six times. 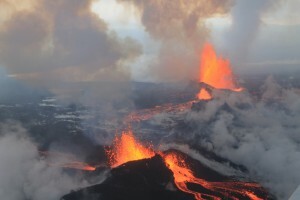 Around the same period the rate of volcanic activity in Iceland soared to at least 30 times today’s level. There is supporting evidence from continental Europe, North America and Antarctica that volcanic activity also increased after earlier deglaciation cycles. Bizarrely, then, volcanic activity seems – at least sometimes – to rise and fall with ice levels. But why? Again, this strange effect might be down to stress. Ice sheets are heavy. Each year, Antarctica’s loses around 40 billion tonnes. They are so heavy, in fact, that as they grow, they cause the Earth’s crust to bend – like a plank of wood when placed under weight. The corollary of this is that, when an ice sheet melts, and its mass is removed, the crust springs back. This upward flexing can lead to a drop in stress in the underlying rocks, which, the theory goes, makes it easier for magma to reach the surface and feed volcanic eruptions. The link between climate change and volcanism is still poorly understood. Many volcanoes do not seem to have been affected by it. Nor is it a particularly pressing concern today, even though we face an ice-free future. It can take thousands of years after the glaciers melt for volcanic activity to rise. Yet while it may not be an immediate hazard, this strange effect is a reminder that our planet can respond to change in unforeseen ways. Contrary to their brutish reputation, volcanoes are helping scientists understand just how sensitive our planet can be. Robin Wylie, PhD researcher in Volcanology at University College London, does not work for, consult to, own shares in or receive funding from any company or organisation that would benefit from this article, and has no relevant affiliations. Facts and Opinions is a boutique for slow journalism, without borders. Independent, non-partisan and employee-owned, F&O is sustained entirely by readers: we do not carry advertising or solicit donations from foundations or causes. Why? We appreciate your interest and support: for $2.95 (the price of a cheap brew) you can subscribe to F&O for a month. If that breaks your budget, a one-day pass is $1. A subscription is required for most F&O original work. Subscribe for free to Frontlines by entering your address in theform on the right (we won’t share your address), or follow us on Facebook or Twitter.